It would be very useful for those of us that stream our SC images to have included the stacking quantity and the total stacked time in the bottom bar where Memory, cooler info, etc. is. 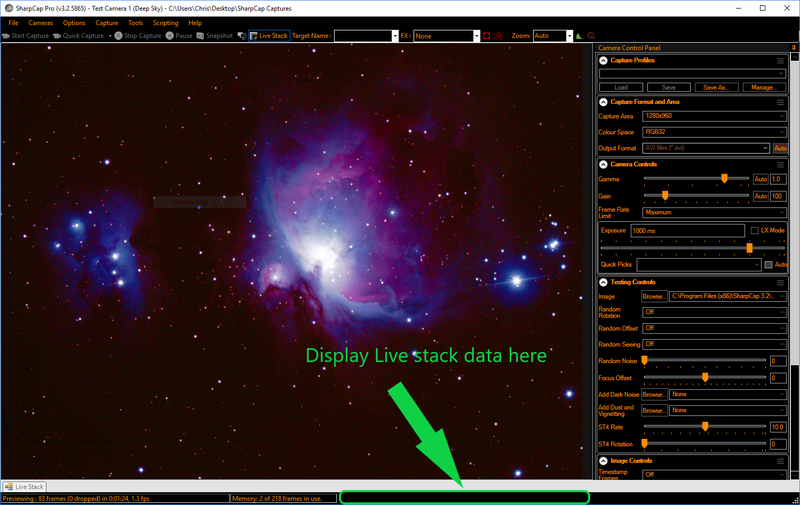 This would indicate to our audience where we are in the stacking process, since we remove the livestack lower window from the stream to provide the largest image size. I'd also like this feature added. I also broadcast and this would be nice to give full view of image plus still provide the stacked data. I've created an image to help better communicate the idea. There's some unused real estate on the bottom SC boarder. Data would include number of subs and total stacked time. After thinking about this a bit would it be possible in a future release to add overlay to the image. If the camera controls menu or lower menu (Live Stack) is hidden. Have a settings dialog with check boxes to enable or disable different stats to be displayed in the overlay. Settings could also have font type, size and other font configs. I think the area I indicated is used for GPS info for the QHY cameras that have the feature. Thanks for adding this to the latest SharpCap build. Glad you found it, fortunately it was an easy one!